Vocal Music in the 21st Century: Is Anything Sacred? A point of view, an address to both mind and heart, a passionate conviction – isn’t that what we hope for in a piece of music? What we often get in these times is sophistication, attitude, polish, aggression. But recently, from an unexpected underground, outlier source, Sacred Music, we are starting to get a reinfusion of meaning, in which the composer and listener inhabit worlds both seen and unseen, in a vocabulary reaching from the oldest to the newest. The music of James Primosch –– immediate and urgent, private and other-worldly –– invites us to travel with him into dangerous and beautiful territory, no less than a cosmic conversation –– dispute and reconciliation and doubt and accommodation –– with our Maker. Even if we are holding out hope no Maker ever existed, we can’t help noticing the appearance, in these pieces, of major issues we can’t avoid. Sacred music. Lord save us! What a scary sounding category. Orphaned, abandoned, archaic. Once music’s principal domain, the composer’s main livelihood: think of Josquin and Palestrina saturating their patrons and listeners with sound, while the painters filled the walls of the Sistine Chapel. Bach was one of the last composers to write sacred music with confidence that it represented majority opinion. The Matthew Passion breathes that confidence, in and out. But while Bach was still alive, a secular culture was rendering his aesthetic obsolete. The Mozart Great Mass in C minor, Beethoven Missa Solemnis , Verdi Requiem, Fauré Requiem increasingly require shadings, demurrals, and edits to describe the composer’s relationships to the text. The 20th century arrived with confidence that religious art had become an archaism, with occasional rear-guard exceptions –– Roualt, Kollwitz, Flannery O’Connor, the later Eliot –– only proving the case. But let’s pause for a moment to ponder Symphony of Psalms, Moses and Aaron, St. Francis. Devout, orthodox, inspired masterpieces by composers rooted in their religious traditions. And other great pieces by composers less anchored in that way –– Dallapiccola’s Concerto per la Notte di Natale, Poulenc’s Gloria, Martin’s Mass for Double Choir. And within the last few years, Passions of a widely disparate content by Adams, Golijov, MacMillan, music by Jonathan Harvey illuminated by his Buddhist faith, programs of music for the Synagogue by Wyner and Adler. 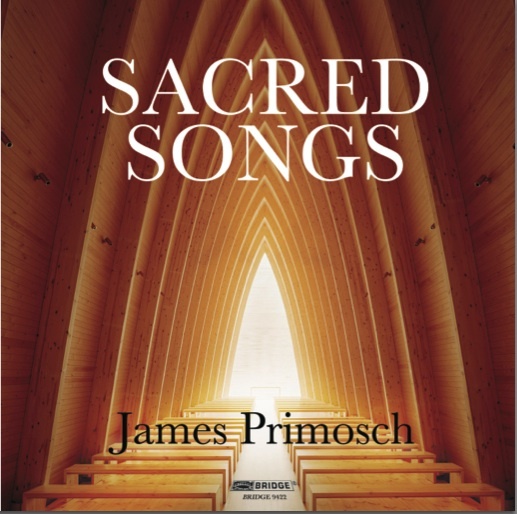 In James Primosch’s music you hear sacred music’s welcome to listeners of every imaginable stamp. He embraces age-old advantages: The composer of sacred music is not on the applause meter. He converses with God, with himself, and with listeners whose mind-set (at least in church) is not evaluative or critical. The envious colleague, the nagging teacher –– both have stayed home. The “professionals” are elsewhere. Who is there? In Primosch’s experience it is people who wish to be reached, touched, persuaded, or given a space to meditate and reflect. At performances of the many motets he has composed for Boston’s Emmanuel Church I have heard members of the congregation tell him that the piece has comforted or calmed or excited or occasioned new thoughts. This is a pastoral function, not something that happens in a tuxedo or tails. Primosch’s mature style bears the marks of a composer who has learned to come to the point, to speak clearly, thanks to a necessary encounter with his subject matter. Like Jacob, he wrestled with the Angel, lost, and has been made strong. His harmonic palette has been culled to make its signifiers more vivid. He builds it from old acoustic principles–– open fifths in the bass register, piled or intersected triads above, ancient modes linked together at chromatic crossing points. The fluent melodies sometimes harken back to plainchant. Grounded though he is in all the latest and most current, the surface of his music has become less “modern,” less local. This makes possible a more radical, pointed kind of emphasis. The music sounds like it intends to be remembered. Motives are felt, rather than just being useful. Quiet static moments are driven home, not just waiting for something to happen. Because of its vivid, fervent expression, Primosch’s music has been taken up by some of our best performers, like the ones on this CD. They bring a set of four vocal-instrumental pieces (each of which exists also in voice and piano versions). The first, From a Book of Hours, is the closest of these pieces to a song cycle. It is four balanced movements, each carrying forward a dialogue which is also a monologue. Four Sacred Songs is a set of variations on given tunes, plainchant and folksong, very revealing of Primosch’s melodic sources as a whole. Dark the Star is a through-composed cantata, the alternation between English and German never interrupting a continuous flow of verbal and musical discourse. Holy the Firm is an unusual juxtaposition of disparate music and text, from contemplative ritual (Susan Stewart’s “Cinder,” a lapidary piece already in high favor as a separate recital piece) to dramatic-operatic scene (Dillard’s “Deathbeds”). The force of the question reinforces something that the composer already knew, that he is a cultural maverick. The answer, “Yes, as much as that is permitted to me on a given day.” At the very least, the composer is suggesting that he chooses to spend his day with such companions as Annie Dillard and John Climacus, and wishes to include us in that sojourn. A word about the author: the catalog of distinguished American composer John Harbison includes numerous sacred works, including a Requiem, the motet Abraham, which was commissioned for the Papal Concert of Reconciliation, and the cantata The Flight Into Egypt, for which he received the 1987 Pulitzer prize. He has conducted Bach cantatas, worked as a jazz pianist, and taught at Tanglewood and MIT.